My name is Jack, I’m 41 years old and I live in Dundee. I had a difficult childhood – I was never close to any of my family members, and I spent a large part of my youth in a children’s home. I’ve been addicted to drugs since I was very young. My stepfather was an alcoholic and I started stealing his Valium when I was nine years old. At first, I took drugs as a way of having some fun; it’s really easy to get drugs in Dundee. However, I soon reached a stage where I became addicted. I ended up living on the streets when I was 16. Being homeless is a very lonely life. One of the worst things about it is that people treat you as if you are worthless. Most people will just ignore you, but some people can be really mean. I’ve been laughed and sneered at, spat on and kicked in the face. Thankfully, there were also some good people who would stop for a chat. I remember how much it used to cheer me up when someone gave me the time of day. About a year ago, while I was begging on the streets, I met Church Army Evangelist Kerry Dixon. We got talking and he invited me for a coffee with him the next day. I started going to Soup ‘n’ Soul and Pirate Monks meetings for men as well. We talk about lots of different things at Pirate Monks – we can choose the topic we want to discuss, then we look at what the Bible says about it. The way that everyone in the group talks about their own personal experiences, struggles and addictions so openly and honestly has really helped me to deal with my own problems. On my 40th birthday, I decided to get baptised. Kerry performed the baptism and it was absolutely great, the best feeling ever – it gave me much more of a buzz than any drug I’ve ever taken! Since I came to faith, I’m not interested in heroin anymore. It’s also been more than four years since I was in prison, which is a record for me. I’ve been in and out of homeless hostels, but a few weeks ago, I got my own little place, a one-bedroom council flat. It feels so nice to have that security, it’s something that’s been missing my entire life. My dream is to have my own house one day. I am also in love. I met Louise six months ago and things are going really well, we’re there for each other. Kerry has really been there for us as well. Anything he can do to help us, he does. Kerry is like a dad to me. Before I met Kerry, I always believed there was something out there, but I was never quite sure what it was. Certainly, things are much clearer now. Kerry has taught me that it doesn’t matter if I pray out loud or in my heart, God will always hear me. I really believe that the Lord is looking after me, now and forever. By September 2015, Dundee City had the lowest employment rate of any Scottish local authority area, with only 63.3 percent of its working-age population in employment (Dundee City Council). 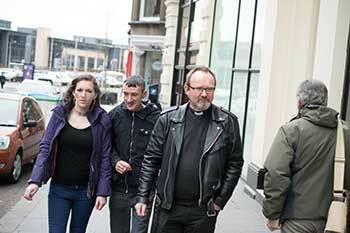 Church Army opened the Dundee Centre of Mission in September 2014. The main focus of the work of the Lead Evangelist, Kerry Dixon, is outreach to the homeless, marginalised and those with substance abuse problems through weekly events like Soup ‘n’ Soul (offering food and friendship to people with difficult life circumstances) and Pirate Monks (a group meeting that encourages men in their daily walk of faith).